In large bowl, beat cake mix, water, oil and eggs with electric mixer on low speed 30 seconds, then on medium speed 2 minutes. Reserve 12 of the peanut butter cup candies for garnish. Coarsely chop remaining candies; stir into batter. Divide batter evenly among muffin cups. Bake 18 minutes or until toothpick inserted in center comes out clean. Cool 10 minutes; remove from pans to cooling racks. Cool completely. In medium bowl, beat powdered sugar, peanut butter, butter and vanilla with electric mixer on medium speed until smooth. Add whipping cream; beat until frosting is smooth and spreadable. Frost cupcakes. 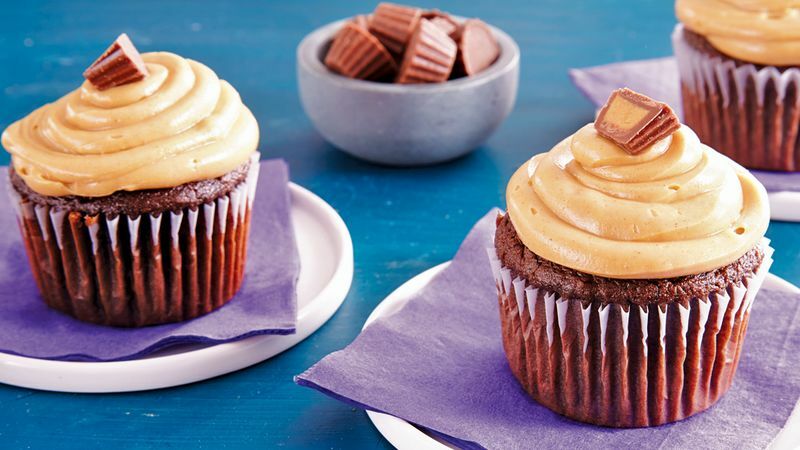 Cut reserved peanut butter cup candies in half; garnish each cupcake with 1 half candy.